After the portrait of the fiesta red 1983 Squier Stratocaster, today’s article features another Japanese vintage Squier, this time an ultra-rare model in all original pink metallic finish. Since all important facts about that great JV series that was available in 1982-83 only have been mentioned in two previous articles (the mentioned portrait of the fiesta red 1983 Squier Stratocaster, and the article about Japanese vintage guitars), I will not repeat these things and concentrate only on this particular guitar. It is the only one in metallic pink I have seen, and before I did not even know that this colour was available. 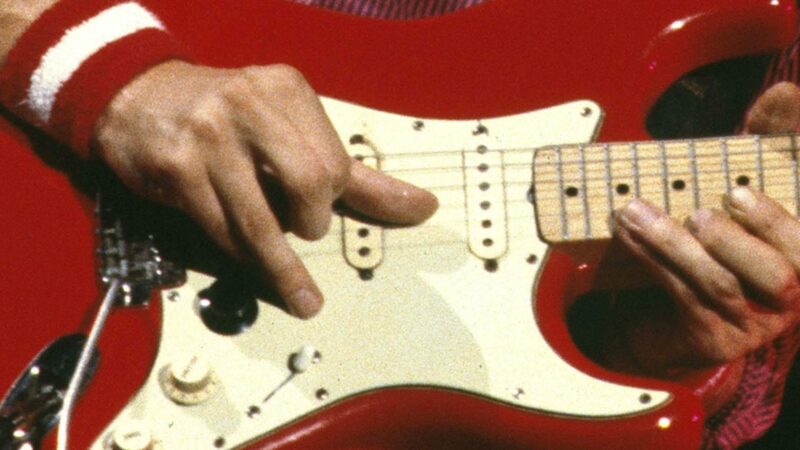 In fact the first Squier Strats were all sunburst, and in 1983 fiesta red, black, and white were added. These were all the colours those Squiers for the world-wide market (the export models) were produced in, but there were a few more for models for the domestic (the Japanese) market: California blue, candy-apple red (CAR), and pink metallic (which replaced CAR in late 1983). There are a few rather small differences between the domestic and the export models, with the most striking beeing the pick-ups which were not the US made Fender pick-ups but Japanese pick-ups called SQ-5 which are excellent and should not be considered as inferior. The finish is thick glossy poly, just like on the export Squiers. Another difference however is the fretboard curve which is probably 9″ as compared to the 7.25″ of the export models or a Fender vintage Strat. 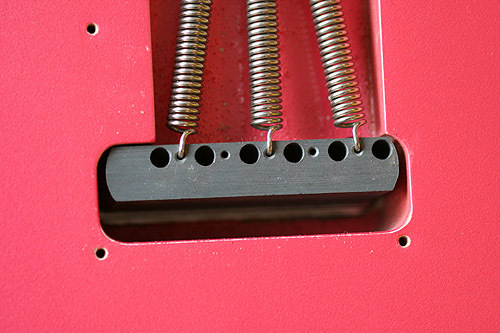 I personally like that 9″ radius because it allows a lower action without string buzzing but still feels like a typical Strat. It seems most CAR Squiers had a shorter scale but this guitar has standard scale length. It sounds great (like most of these JV Squiers) and I like it a lot. great guitar! What can you say about the compare with a USA Stratocaster and will the prices of the Squier JV series increase? I always had the feeling that the sound of those Japanese guitars was not worse, in many cases even better than of American guitars of the same time. I believe that the price not only for the Squier JV but generally for Japanese vintage guitars will rise. I just picked up a metallic pick JV squier also. It is a JV 6 series and it sounds and plays great. Hi everyone I jumped here to see more about the signature srat of MK but then I read all your articles concerning the japanese strats by squire. I myself have a contemporary japanese strat, name is st62tx, has quite the same features of the signature mk strat, like fiesta red, 7,25 radius, rosewood fingerboard, vintage machine heads, texas special pickups. Price from Japan around 700 euro, but hey!!! This is much better than the mk strat that I tested in Verona (Italy), resonates very very well. My friend has a japanese 54 strat and sounds like no other strats I ever played (maybe the Eric Johnson is similar. So if you have the chance to test one of the contemporary japanese strats don’t miss it, they are really great!! I own one of these JV squire strats, but until today I didn’t know it was such a special guitar. I’ve owned it since i was 13 in 1994. It is (was) California Blue. I bought it at a yard sale with a little Fender Champion 110 amp. The guy had taken the paint off with some chemical (but the colour is still behind the plate on back of guitar). Then he stained the body. It actually looks great! Very similar to Bonnie Raitt’s brown wooden strat. It’s ALWAYS been my favorite guitar. It sounds and plays amazingly! I started playing when grunge and nu-metal were just getting big. This guitar can handle the low chunk (low A tuning), without muffling the high note contrasts. I don’t think the pickups are amazing (a bit of hum), but in the second and fourth pickup positions, this thing turns into a jazz beast. …i will never get rid of this guitar. Thanks for your comment, yes, those JV Squiers are great.